Representing the next evolution of our SUV family, the KONA small SUV joins the Tucson and Santa Fe 4x4, offering the same all round ability, distinctive style and latest technology. The best moments in life are the ones in which the world doesn’t shape us – but we shape it. 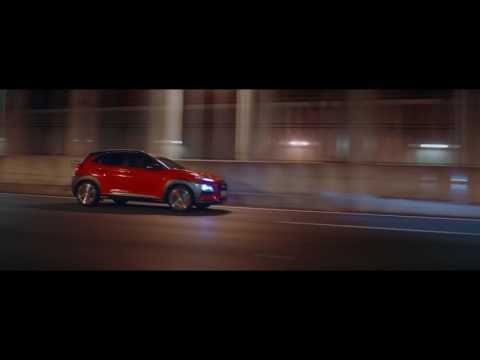 That’s why the all-new KONA offers a cutting-edge combination of style, technology and performance to help you define it according to your rules. It’s the attention to detail that makes the all-new KONA so special. The stylish cabin reinforces the stand-out exterior design, with high quality materials throughout and plenty of connected technology for good measure. Following the road is one thing. Bending it to suit you is something else. The all-new KONA offers the choice between two highly efficient, turbocharged petrol engines​. The KONA delivers up to 176PS with agile turbocharged petrol and diesel engines, plus 4X4 on selected models. KONA’s 6-speed manual transmission is optimised for use with the 1.0 T-GDi turbocharged petrol engine, delivering impressive fuel efficiency and responsiveness with every shift. Choose your mood, connect with your music and connect with your world. The KONA features performance audio, seamless connectivity and ultra-modern tech to keep you in touch, on time and protected. The all-new KONA Premium GT offers four wheel drive for enhanced handling and cornering. Advanced Traction Cornering further improves KONA’s agility and stability, actively distributing torque while accelerating in curved sections. Autonomous Emergency Braking (AEB) with pedestrian recognition. The Lane Keeping Assist system uses the front camera to monitor the lines of the road. In the event of an unintended lane departure, it will first alert the driver and then apply counter-steering torque to get the car back on the correct course if necessary. Standard on Premium SE and Premium GT trims, this smart system uses two radar sensors in the rear bumper to keep track of traffic in your blind spot. An alert will sound if you indicate to change lanes when a vehicle is occupying your blind spot.